There is nothing to admire technically or aesthetically about this picture but this is one of those occasions where it makes it onto this blog because it truly encapsulates the day and tells a story. 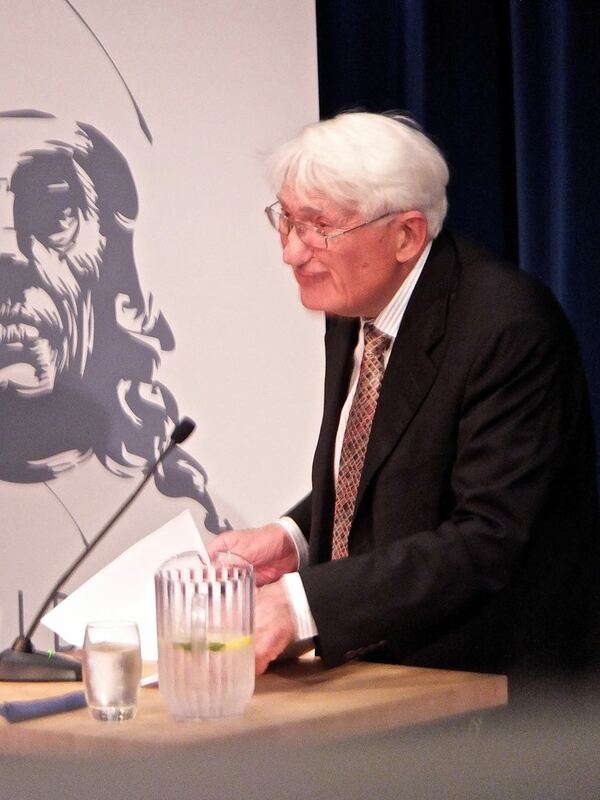 Back at the turn of the millennium I wrote my PhD on the work of this guy, Jürgen Habermas, who I — and a lot of other people — would say is the world’s greatest living political theorist. Largely through coincidence he was giving a public lecture in Stavanger this week when I happened to be here, so I got the chance, after all this time, not just to hear him talk but meet him and question him on his work. The musical equivalent (for me) would be to, say, have turned up somewhere random and found Ian Curtis or Jello Biafra giving a gig (and the former has been dead for 34 years). And another thing — Habermas is 85 years old but is also a brilliant advert for never ever retiring, I don’t think I’ve ever seen someone his age who’s so hale and mentally alert, and also still obviously gives a crap about everything. Yes, we can say that today, I met one of the heroes of my life and was certainly not disappointed. Not bad for a Thursday.